This is a famous Scottish surname. It is locational from the ancient barony of Borthwick, by Borthwick Water, in the former county of Roxburghshire. It is said that the first recording of the surname is in the year 1368, when one Thomas de Borthwic and his son William de Borthwic appear as joint signatories to a charter of transfer for lands at Middleton in the county of Midlothian. This would suggest that the nameholders had left Roxburgh, and as was typical of those days, took or were given, as their surname, the name of their former homestead. Spelling being at best erratic and local dialects very thick, often lead to the development of alternative spellings. 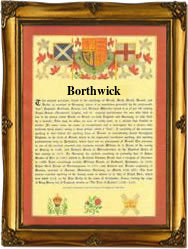 Certainly the Borthwicks as they now appear in the charters, were soon prominent in their new county, and the name is recorded on a regular basis in the surviving records. So much so that only ten years after in 1378, William de Borthwick renamed his estate of Catcune as 'Borthwick', and it would seem that the ownership of these lands remained in the original family for at least two hundred years. From about the year 1500 the surname spread to the north, with William Borth being a commissioner for Parliament in Aberdeen in 1505. There has been a claim that the family of Borthwick descend from a Hungarian knight called Andreas Burtick, who was the ambassador to Scotland in the 14th century. However this is unproven and would not seem to equate with the early known recordings.